Pre-heat the oven to 180 C/355 F. Grease a 25 cm/9 inch cake tin and line the bottom with a round of baking paper. Wash the rhubarb stalks, cut into 1 inch lengths and while still slightly damp from washing, in a small bowl combine with the 2tsp of extra castor sugar to coat and set aside. Beat the eggs and sugar using either a hand-held electric beater or a stand-up mixer for 5 minutes until very thick and pale in colour. Slowly beat in the soft butter, then beat for a further few minutes. A few small lumps of butter will remain, this is okay. Gently fold in the almond meal, rice flour, baking powder and lemon zest. Spoon the mixture into the cake tin. Dot the rhubarb pieces on top, gently pushing them down into the batter a little. 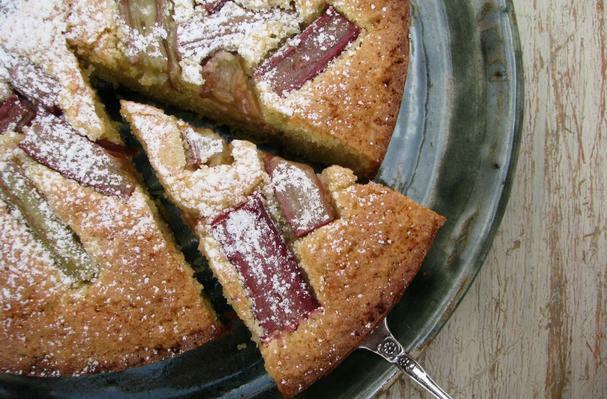 Bake for 35-40 minutes until a skewer pushed into the centre of the cake comes out clean and the rhubarb is tender. Cool in the tin before serving dusted with icing sugar and softly whipped cream on the side. Enjoy! The recipe sounds delicious! I don't have caster sugar on hand, but will pick up some right after I get the fresh rhubarb at the farmer's market. :-) (P.S. Please note that "merengue" is a Latin dance) Cheers!